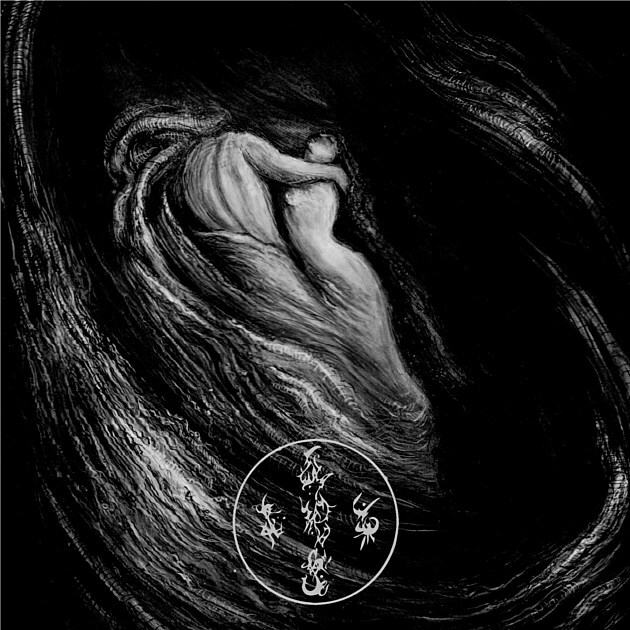 Ævangelist‘s Writhes in the Murk sounds like Debemur Morti‘s entire discography played at the same time. It’s slithering death metal, cosmic horror black metal, back alley industrial, and the Promethean scream of noise. Needless to say, it’s extreme, which makes this either the greatest or worst sales pitch depending on the type of metal you currently seek out. Here’s the dividing line: There’s a phase some metalheads go through where the end of the extreme spectrum is all that matters. (There’s no age range attached to this, the phase might last a lifetime. Recurrence isn’t uncommon. If you’re there, lucky you. It’s a nice place to be.) Metal uniquely caterers to this desire, treating the phrase ‘over-the-top’ as if it was a sport logging records that are meant to be bested. While you’re in the extreme phase, you love that sports mentality because you love what it tells you about yourself. By exploring the outer limits, you’re testing your own limits, chipping away chunks of character until you discover an identity. Then comes a day when that pursuit unexpectedly ceases and anything tagged as “terrifying” is a kitten’s meow compared to the first five minutes of the evening news. Put simply: People who search out extremes will love this album. Those who don’t, won’t. That’s not to say what Ævangelist are doing isn’t worth your time if extremity isn’t your be-all and end-all. It is. Writhes in the Murk is an interesting album, one that you should play at least once, though it’s better served if you can give it a few spins. It’s inventive and, holy crap, is it busy. The amount of sonic detail packed into Writhes‘ 59 minutes could even make Steve Austin’s eyes cross. Matron Thorn (all instruments, noise) and Ascaris (vocals), the two American nuts behind this muck, have plenty of worthwhile ideas. If only they could separate a few of them from the total sensory overload. . . Still, endure Writhe‘s downsides and you’ll find every song has one great riff or passage. Opener “Hosanna” fires up a chug around the 2:15 mark that burns through the thick cloud of nonsense proceeding it. “Disquiet,” the most immediately palatable cut, is an industrial instrumental that eases back on the internal mandate to brick the waveform. “Harken to the Flesh” has the best death metal moments, gathering up bone-rattling riffs, sinewy leads twisting together in a Bosch-ian nightmare, and Ascaris’ deliriously feral guttural into an unnerving whole. The closing title track takes a break from the through-composed madness to use repetition to its advantage, planting a seed that sprouts and blooms over its nine minutes. It actually unlocks the rest of the album. When “Hosanna” loops back around, Writhe starts to fall into place and legitimately catchy sections crawl out from the ooze. If you can believe it, that first listen teaches you to tune out the noise. Musique concrète practitioners would be pretty proud of that trick. But, yeesh, that first listen is a chore. (Then again, that might be the point. Ævangelist probably don’t want fair-weather listeners.) Tracks that should stick don’t, vanishing in a puff of WTF. “Ælixir” evokes compelling imagery if you’re in the right frame of mind — a murder occurring behind a city dumpster while, down the block, a saxophonist plays for tourist’s change — but it can also be plain annoying, like a drunk Philip Glass composing for his next haunted house by using his nails on a chalkboard. It’s a tough pill to swallow, especially if your planner is packed and thoroughly-explored albums of yesteryear are constantly calling. However, for those stretching out in the extreme phase, welcome to a new level of extreme metal. May you find yourself while working towards clearing the bar.